The Thoroughbred Breeders’ Association (TBA) has put forward plans for the racing industry to back a new racehorse owners’ premium scheme, based on rewarding British-bred produce, following today’s publication of the British Thoroughbred Breeding Industry Economic Impact Study 2018. The study was commissioned by the TBA from world-renowned analysts PricewaterhouseCoopers. It follows the lines of a similar exercise conducted in 2014 and has the benefit of being able to draw on trends, which demonstrate that although Britain has a world-class racing industry, the economics of thoroughbred breeding need reversing through increased demand at public bloodstock sales. The TBA’s proposal, the first of several being developed over the coming months, faces up to the reality that without horses and those who breed, own and race them there would be no racing, and aims to create a virtuous circle around breeding horses in Britain, owning them and finally returning them to stud. It builds on two existing initiatives, the Plus 10 programme on the Flat and the National Hunt Mare Owners’ Prize Scheme (NHMOPS) for jump racing, with the major difference that bonuses will be wholly focused on British-based criteria. The major element of the proposal is a scale of bonuses for nominated foals out of British-based mares, graduated according to whether they are visiting British-based or overseas stallions. Around 850 races for two- and three-year-olds and a further 150 fillies-only races on the Flat and about 1,900 jump races will carry bonuses, and it is envisaged that substantially higher prizes will be offered than at present. The TBA wishes to thank the HBLB and Racing Foundation for their financial support of the EIS and all of the individuals and organisations who contributed to the report. 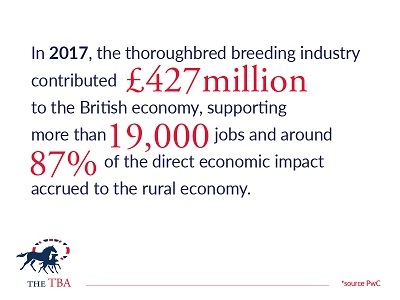  In 2017, the thoroughbred breeding industry contributed £427 million to the British economy, supporting more than 19,000 jobs, and around 87% of the direct economic impact accrued to the rural economy.  The number of broodmares has increased by around 500, to 9,000, since 2013, and the number of foals born annually has gone up from 4,420 to 4,778 in the same period. 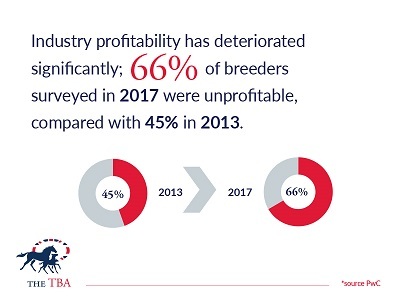  However, industry profitability has deteriorated significantly; 66% of breeders surveyed in 2017 were unprofitable, compared with 45% in 2013. 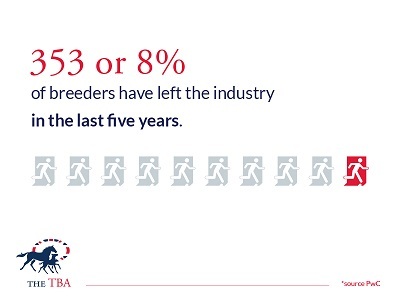  353, or 8%, of breeders have left the industry in the last five years. 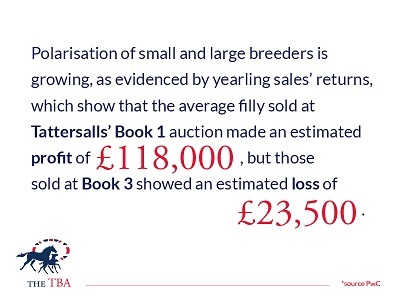  Polarisation of small and large breeders is growing, as evidenced by yearling sales’ returns, which show that the average filly sold at Tattersalls’ Book 1 auction made an estimated profit of £118,000, but those sold at Book 3 showed an estimated loss of £23,500. 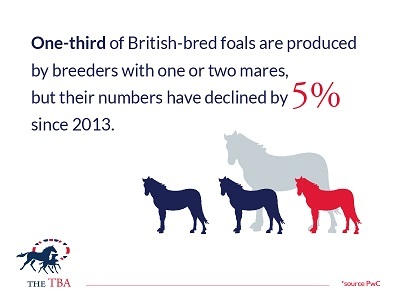  One-third of British-bred foals are produced by breeders with one or two mares, but their numbers have declined by 5% since 2013. 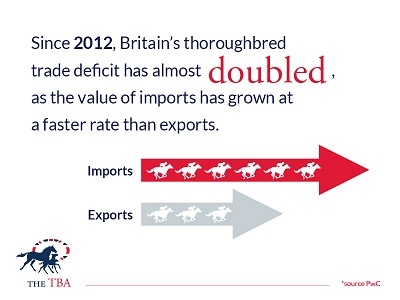  Since 2012, Britain’s thoroughbred trade deficit has almost doubled, as the value of imports has grown at a faster rate than exports. 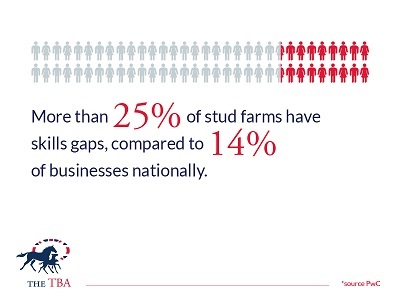  More than 25% of stud farms have skills gaps, compared to 14% of businesses nationally. “The EIS results show that although we have a world class industry the economics of breeding thoroughbreds simply isn’t working. In the last six years our trade deficit has almost doubled, with imports growing at a faster rate than exports. We need a system to encourage and promote British breeders and their bloodstock, to create a favourable environment for them to operate. On proposed solutions to issues raised by the EIS….